Following yesterday's report that "hedge fund darling" stocks were slammed the hardest during last week selloff, we decided to take a look at which sectors are most exposed to hedge fund ownership. Conveniently, overnight BofA's Savita Subramanian put together her latest analysis looking at "what your neighbors are doing", i.e., where active fund managers are most concentrated. Even better, the analyst was retroactively adjusted to reflect the latest industry reclassification which broke out the brand new Communications Services sector. What BofA found is that Communication Services is not only overweight by large cap active managers (relative weight of 1.29x), but is more crowded than any other sector, and is also near a record overweight vs. its history (based on data since 2008), which is one reason for the bank's underweight weighing on the sector. Meanwhile, as a result of the sector split, managers’ relative exposure to Tech has dropped from 1.16x pre-GICS change to 1.08x (similar positioning to Health Care), as crowded stocks such as Facebook (FB: 1.50x) and Alphabet (GOOGL/GOOG: 1.49x/1.61x) have moved into the Communication Services. But elevated crowding risk in the new sector is not just within the Internet stocks: the Media (1.55x) and Entertainment (1.41x) industries are also near record levels of positioning by large cap managers, while Diversified Telecommunication Services (the “old Telecom”) is the only underweighted (0.48x) industry in the Communication Services sector (Chart 1). What about at the individual stock level? 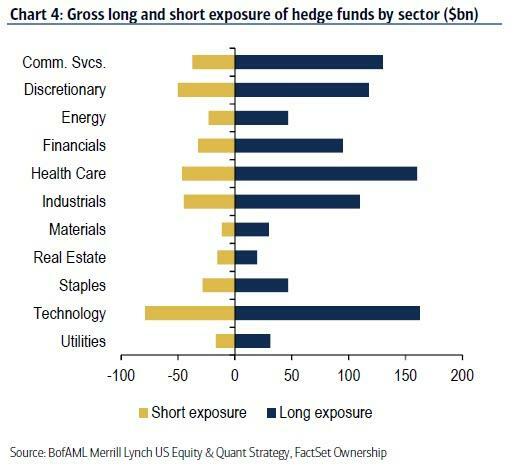 And to complete the hedge fund exposure picture, BofA also performed a screen of 1) stocks which are most overweight by hedge funds based on their net relative weight in the stocks vs. its weight in the S&P 500 and 2) a screen of stocks which have the largest net short positioning by hedge funds relative to the stocks’ weight in the S&P 500. Why is the above analysis relevant? Because as we first discussed 5 years ago, the best performing strategy in the market has been also the simplest one: buying the most underweight stocks by large cap active funds and selling the most overweight stocks by large cap active funds has consistently generated alpha (although 2017 was the only year when this trend was bucked). 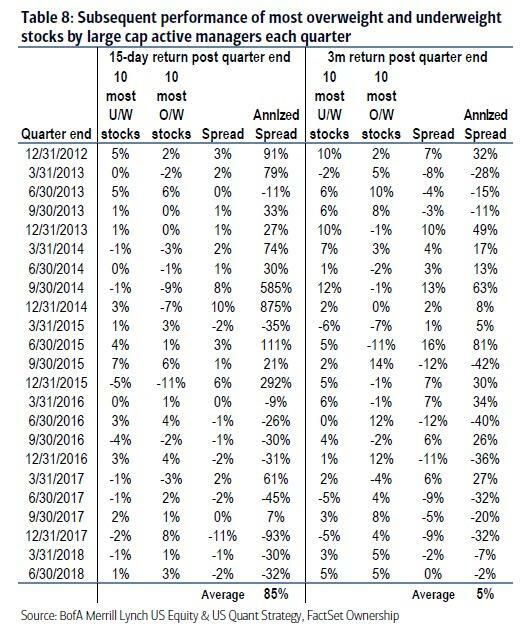 And with earnings season about to start, traders may put the above data to good use as positioning risks are particularly acute during quarter-end rebalancing: the 10 most neglected stocks have outperformed the 10 most crowded stocks by an annualized spread of 85ppt on average during the first 15 days of each quarter since 2012. In other words, buying the 10 most underweight stocks and shorting the 10 most overweight remains the best source of alpha this decade.